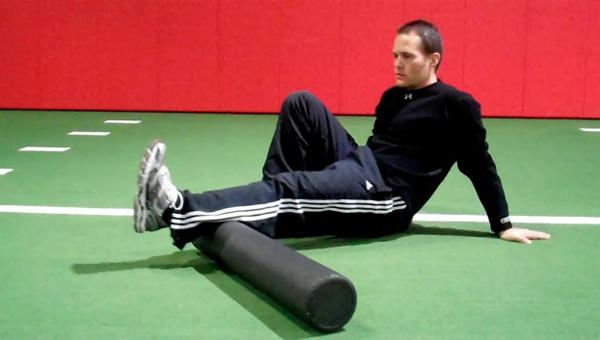 A foam roller is a tool used for self massage. It comes in the shape of a long cylinder. Some can have various textures, like soft lumps on it to make the massage slightly more intense. Most, however, are smooth. They come in various densities. The white color is usually the softest. Light blue is usually a mediocre density. Black is a hard density but still has some give to it. The hardest thing that you can use is a PVC pipe. Fascia is a connective tissue that runs throughout your body. Myofascial release is the process of making the fascia more pliable. When it is really stiff it can be hard to stretch the muscles. It can also cause joint pain and muscle imbalances. To use the foam roller you use your body weight to place pressure on each muscle group as you roll back and forth on top of the foam roller. The massaging pressure releases stiff points in the fascia tissue to make muscles more stretchable and contractible.